Experience the charm of life in Stowe Village, one of Vermont's most beautiful mountain towns. Light, airy and clean apartments boast scenic views of the Stowe Community Church, the Green Mountains or historic Stowe Village. Our location, across the street from the internationally acclaimed Stowe Recreation Path and on the Mountain Shuttle route, provides easy access to all the wonderful activities Stowe has to offer. Built in 1835 and completely renovated in 2009, Butler House Stowe was home to one of Stowe's first attorneys, Orion Butler. Orion's Retreat, Sarah's Suite, The Parlor and The Lounge in the main house have high ceilings, village views and details that old house lovers will adore such as original pine floors, deep windows and fireplaces (some working). Attached to the main house are 4 unique apartments that feel more contemporary but are equally enjoyable. All rooms have cozy seating areas, comfortable beds, fully equipped kitchens/kitchenettes and sparkling clean bathrooms. 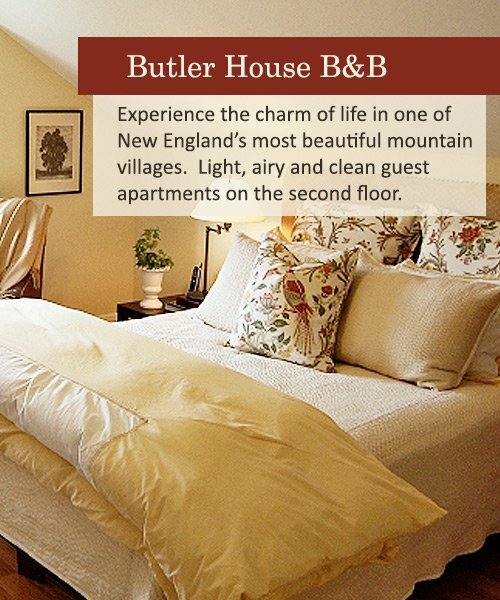 Enjoy life like a local in the heart of Stowe Village! Treat yourself to a delicious breakfast at Butler's Pantry and see what people are talking about! *Featured in Yankee Magazine's January/February 2019 issue along with other great places in Stowe!